Why is there no better book for learning Hebrew than this? Many, many reasons. First of all, Zola’s primer teaches both print and script, so you will be ready to read, speak, write and understand Hebrew in Israel as well as in heaven. Second, it progresses gradually enough that even the faint-hearted will find immediate value in it, nurturing them to proceed on a friendly course toward a unique intimacy with God’s language, land and people. Unlike “kiddy” primers, this one serves as a benevolent tool for transliterations from the Bible. Dedicated students will find themselves reading the text with Sephardic pronunciations and feeling a sense of real accomplishment. Using an “adult-learning” model, it includes plenty of practice. 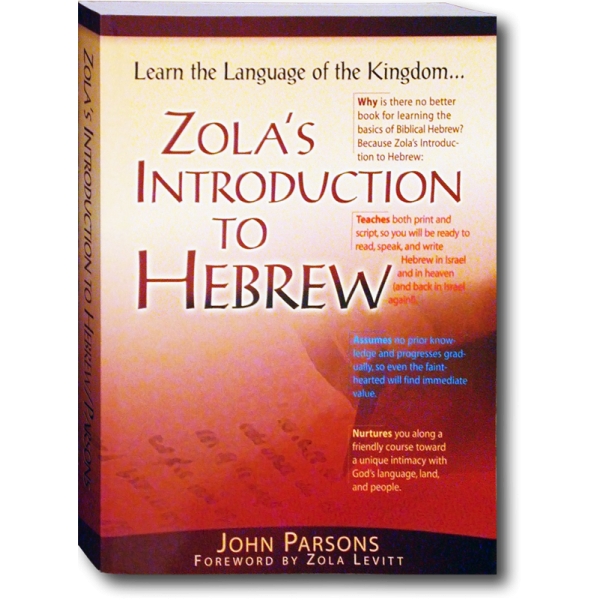 At over 400 pages, this text is all you need to progress from knowing not one letter of Hebrew to reading and speaking it with confidence. If you have enjoyed our Levitt Letter Hebrew Lessons, then you have already experienced some of John Parson’s enthusiasm for you to learn the language! Foreword by Zola Levitt.